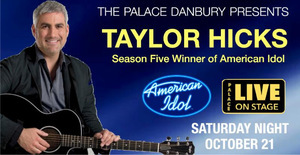 American Idol Winner Taylor Hicks this Saturday At The Palace Danbury! Remember voting for American Idol? In Season Five over 64 million people voted and Taylor Hicks won and became a worldwide sensation! This Saturday night Taylor is coming to The Palace Danbury on Saturday, October 21st at 8 p.m. to perform classic Idol hits as well as his new music. Opening the show is Amanda Ayala from NBC's The Voice. Adam Levine, Pharrell Williams, and Blake Shelton all competed with one another to get this talented young rocker from Mahopac on their team. See her in Danbury and be prepared to be blown away! And for all you single ladies- People Magazine named Taylor the hottest bachelor in America!! !